We've always stated the same thing and continue to state it. Deflation IS possible but highly unlikely in a system where a man who goes by the moniker, "Helicopter Ben", can print unlimited amounts of currency units to keep the anti-capitalist western monetary system limping along for just a little while longer... just long enough for a bunch of thieves and murderers with names like Obama, Sarkozy, Merkel and others to get out of dodge before the collapse. The deflationists have now been wrong, at least in the US, since 1938. That was the last time there was actual deflation. Our chart of the US True Money Supply dating back to 1959 show that only for fleeting moments is there any hint of that line going south. Inflation is defined as an increase in the money supply. 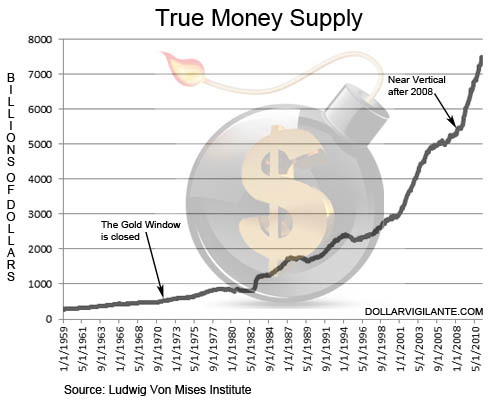 Deflation is a decrease in the money supply. Prices are a SYMPTOM of increases or decreases in the money supply. This is very, very basic stuff. Unfortunately, in world-improving, highly socialist "institutions" such as Harvard, Yale and Princeton the last few sentences may as well have been written in Nepalese. They speak a language called Keynesian and have a religious belief that drawing pictures on pieces of paper can make everyone rich. They probably also stomp up and down on a bag of chips to make more chips, too. For months the Germans and Europe had everyone on edge. Would a western nation actually default, have its entire banking system collapse, impoverish almost all middle class savers and reduce the size of their monstrous socialist welfare governments by a massive amount, throwing millions into the streets unemployed and penniless? The answer, once again, was no. It was no surprise to us here, as we have always stated that was the much more likely route chosen. Every other time in history when a democratic overindebted government with a fiat currency was faced with collapse or hyperinflation they always fire up the choppers. The reason is simple. It's the easiest way out for the politicians. Obama would much prefer the dollar goes into hyperinflation - something he can blame on greedy corporations, or China, and whip the rich-haters into a frenzy - than to walk up to the Presidential podium and go down in history as the President "in charge" when the US empire collapsed. They've been doing this for millennia. They weren't fiddling as Rome burned because the government took responsibility and undertook a self-imposed discipline. Rome was alight because the government overspent massively on military excursions, bread and circuses and used coin-clipping and other means to devalue the currency. That all might sound familiar to Americans today except coin-clipping has been replaced by computerized fiat note creation. And so, today along with the Bank of Canada, the Bank of England, the Bank of Japan, the European Central Bank and the Swiss National Bank, the Fed announced it is cutting the penalty that it charges over a basic rate from 100 basis points to 50 basis points. It sounds innocuous enough. But what that statement really means is that every major western money-printer will do whatever it takes to ensure that capitalism is never allowed to take place. It's no longer "too big to fail", it is "to fail is not allowed". Entire legions of zombie banks and nation states will continue to lurch forward, completely dead on the inside, but animated by endless amounts of fiat money that will only ensure a hyperinflation of all western fiat currencies. It is possible they could keep this game going for a few more years. Probably not much longer than 3 or 4, however. And it could happen much sooner than that, so to not prepare now is the height of risk-taking. We've been preparing by owning precious metals and the companies that mine or explore for gold and silver. As all the western central banks have shown their outright commitment to printing money we believe that it will ignite a gold & silver stock bubble that will be one for the ages. And, as we've outlined for subscribers over the years, we will then hope to "cash" in our stocks at ludicrous gains and look to get into hard assets once again in preparation for the final hyperinflationary crack-up collapse. It won't be easy... and that's why we try to provide subscribers with as much information and analysis as possible to survive The End Of The Monetary System As We Know It (TEOTMSAWKI). But, yet again, and for the thousandth time in a row, the deflationists have been proven wrong and the inflationists have been proven right. Subscribe to TDV today (90 day moneyback guarantee) to access our Special Report on How to Own Gold as well as get complete access to our newsletter and portfolio selections.